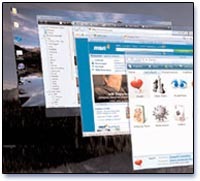 AERO gives that glassy effect in Windows Vista. This takes lot of resources and sometimes tend to slow down the system. There are situations when you want to turn OFF this feature to optimize performance for some quick work to be done. On the contrary you would like to turn ON this feature to play a quick game. Right click on desktop screen (not on any icon). Click on ‘New’ & then click on ‘Shortcut’. Isn’t this so simple and easy? This should be helpful in quickly turning it ON or OFF when playing game with Aero ON or working in Office with AeroÃ‚Â OFF.